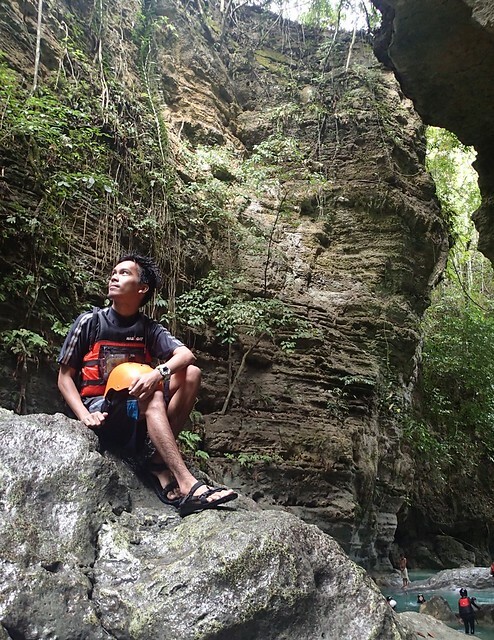 Kawasan Canyoneering is the Best Adventure in Cebu! There were no other words that uttered from my lips but “It was the best!” when we were asked by our tour guides what we can say about the activity. 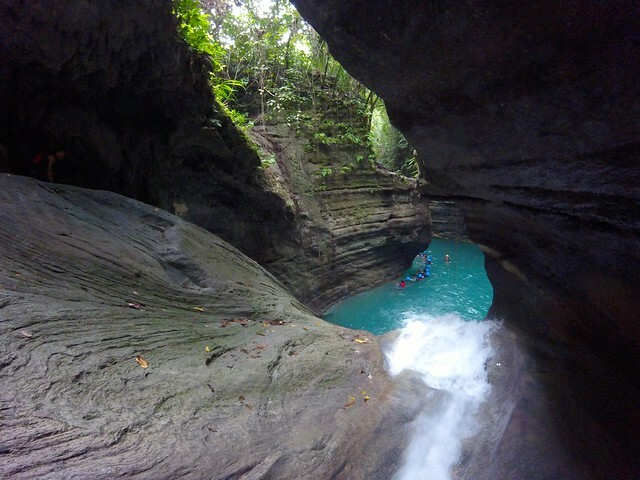 True, canyoneering was the best adventure I’ve ever experienced. It was challenging and fun at the same time. And I really enjoyed it most especially I was with the best team. 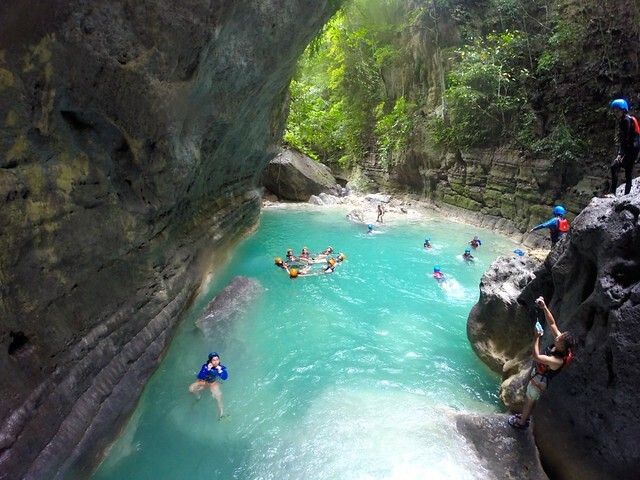 It was few years ago when Cebu started to offer canyoneering as their latest adventure. Seeing photos online of how exciting this activity was and how scenic the river where this adventure takes place instantly made me wanted to try it myself. As a person who loves adventure, I immediately put it on my bucket list. 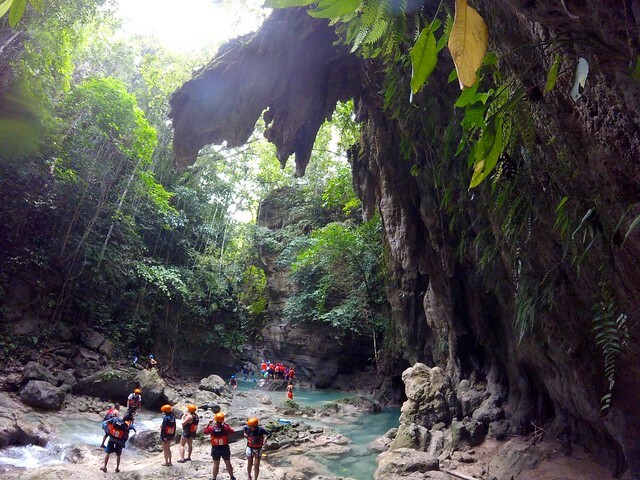 Canyoneering in Cebu takes place at Kanlaob River, which is also known as Matutinao River. 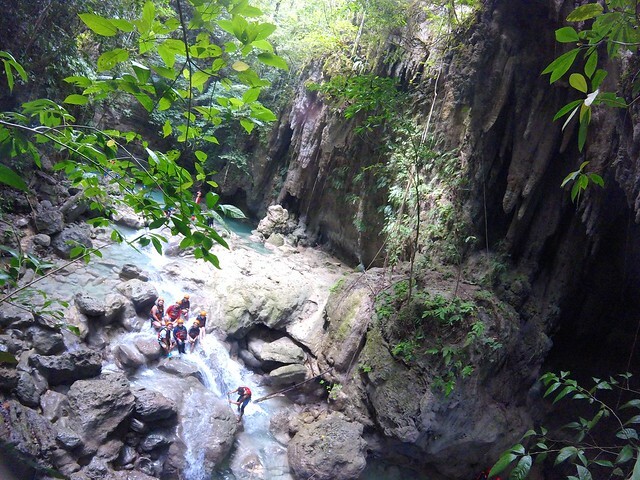 Canyoneering is an outdoor activity that involves traveling down creeks or streams within a canyon by a variety of means including walking, swimming, jumping and etc. There are two types for this activity; namely, upstream and downstream. 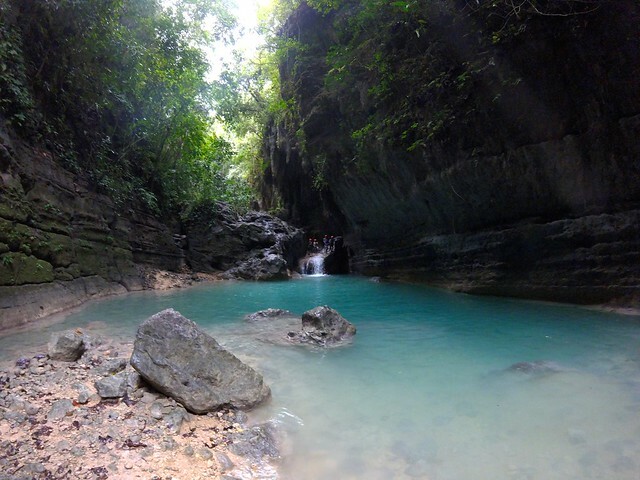 Downstream canyoneering in Cebu starts from Barangay Sulsogan in Badian and finishes at Kawasan Falls while the upstream canyoneering begins at Kawasan Falls and ends up at Barangay Sulsogan. 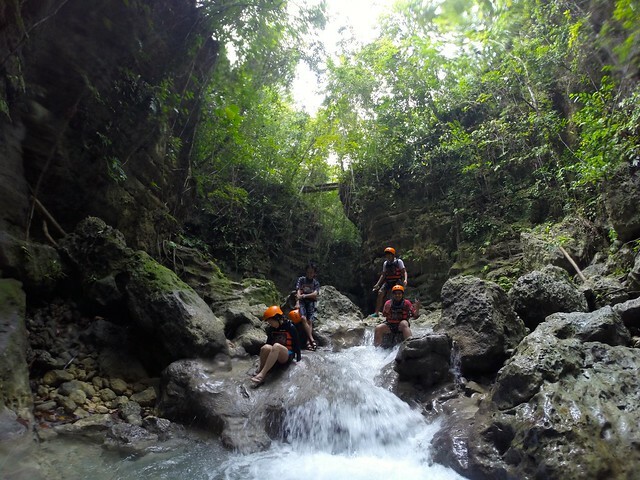 For upstream canyoneering though, one needs to bring ropes in order to climb up to several waterfalls. It was downstream canyoneering that our group tried. Our call time was at 8:00 AM in Matutinanao Beach Resort in Badian. We were told that from Cebu City, buses to Badian could get jam packed easily most especially on weekends. And since we didn’t want to get stuck on that scenario, we left the city before dawn. The bus ride to Badian took us around 3 hours. It was around 7:00 AM when our group arrived, which gave us an ample time to prep up and have some breakfast before we get to this extreme water activity. 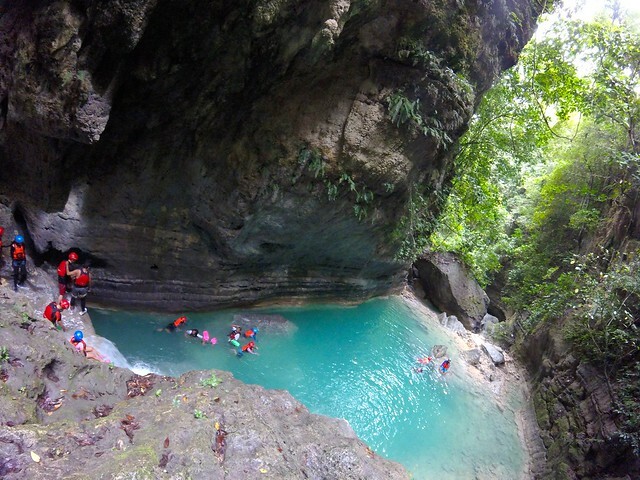 There are now a lot of tour operators offering this adventure in Badian. Since this is a serious activity, one must be cautious when choosing a company to join to. 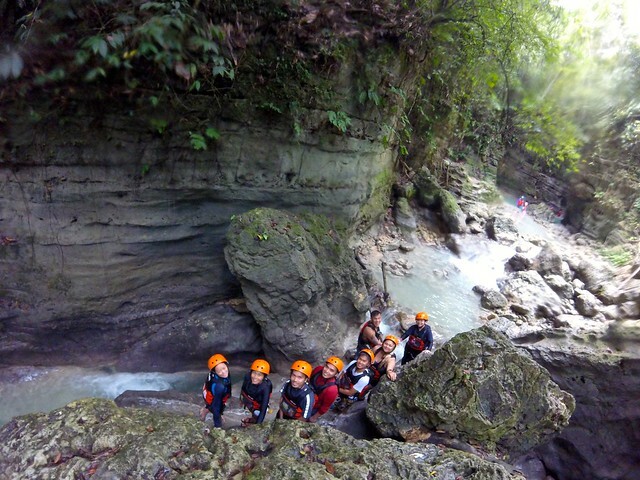 And our group was lucky to have Kawasan Canyoneering for this. 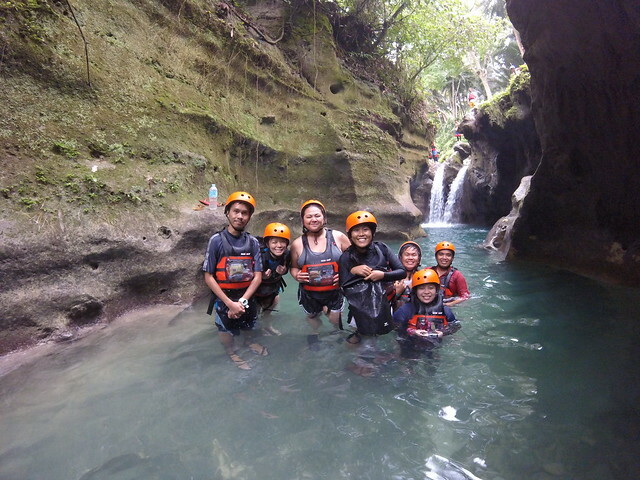 They have a team of experienced Kawasan Falls guide. Safety is their top priority. But that doesn’t mean leaving the “fun” thing behind. The guides assigned to us were Marvin and James. They are well-trained canyoneering conductors. They know the activity and the river so well. 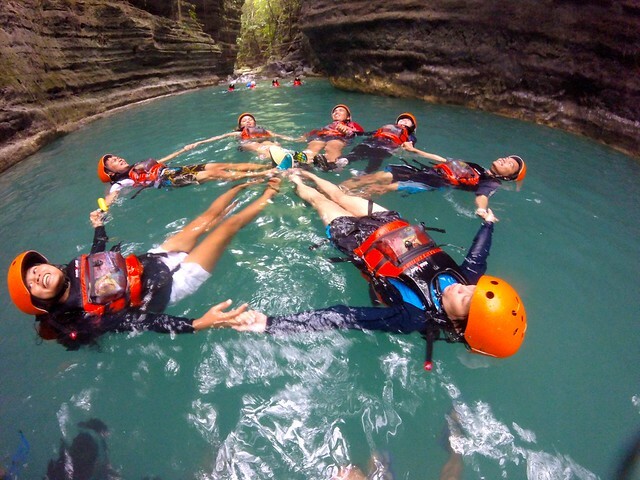 They are fun and serious – serious about giving a memorable and safety canyoneering experience. And the golden rule to have a safe and enjoyable canyoneering experience is always follow the instructions of guides. Introduction and briefing was made for the group before we got in to the actual activity. Gear and life vest were also given to us. Bottled water and a cupcake were also provided. Now, let’s start the actual adventure! After a motorbike ride and a small trek, the real adventure finally began. 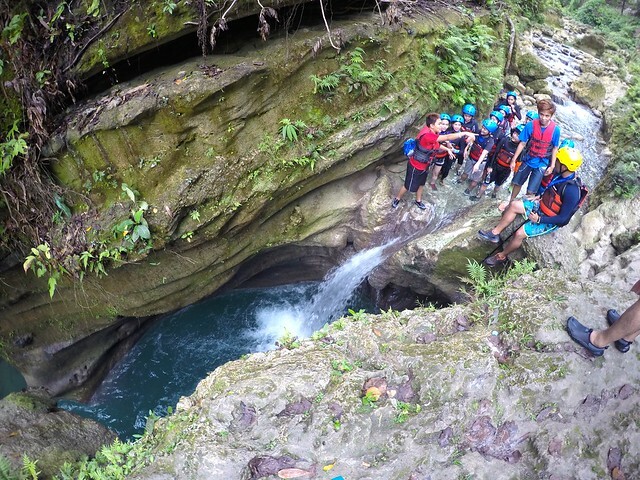 The actual canyoneering started with a jump. We were told that there would be a lot of jumping during the course. But I was surprised that we had to do it that early. Really, we needed to jump already? Not to boast about but I wasn’t actually afraid of jumping. But upon seeing how high it was; butterflies suddenly got into my stomach. And since no one wanted to jump off first from our group, we made a little hand game to know who should go first. And *drum rolls*, the girls lost the game and as a consequence they have to jump first. It was really high from the top. I was little terrified but seeing my friends who jumped ahead of me were still in one piece, I knew I could do it. It is safe. So after counting 5, 4, 3, 2, 1… I made my first jump and screamed at the top of my lungs. I’m alive! Well, it wasn’t that scary. Kidding! Now that I had overcome the jumping part, what troubled me after was the coldness. The water was very cold! I was shivering most of the time. I should have worn rash guard with long sleeves. The jump was followed by more thrilling activities. We glided, floated and jumped. 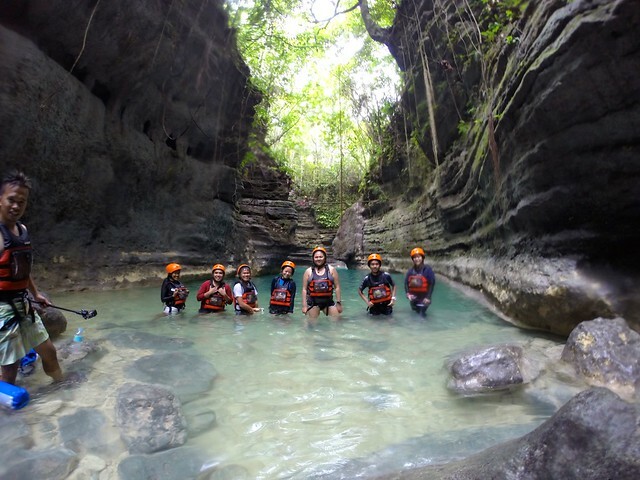 Our guides wanted us to experience canyoneering not only as a serious activity but also a fun adventure. Our guides would ask our group sometime to float and form a circle. Form a flower, they said. So that’s the flower! It was actually fun! I was in awe while canyoneering through Kanlaob River. I love its natural surroundings. The scenery was spectacular. The view and the turquoise color of the river was indeed an added treat for our adventure. And I just hope that tourists won’t abuse the beauty of this place. But I was delighted to learn that Kawasan Canyoneering team has a cleanup drive every month to collect trash from the river. But even though the community organizes such effort, let’s all be responsible and let’s keep the nature beautiful and clean as it is. Canyoneering is indeed fun but it could also be really tiring. So taking a break is always a good idea. In the middle of the course, there was an area selling barbecues and drinks. It was a perfect spot for some snacks before proceeding to a more exciting part of the activity. We were canyoneering for more than two hours already. Luckily I had some small cash with me. I bought some barbecues to at least fill up my hungry stomach. Few more jumping, floating and walking, we finally arrived at Kawasan Falls. Our guide told us that we could still jump if we want to because there are still some areas at Kawasan Falls wherein one can do cliff jumping. Three from the group tried it but only at the first station, just a final jump before completing our great adventure in Badian. 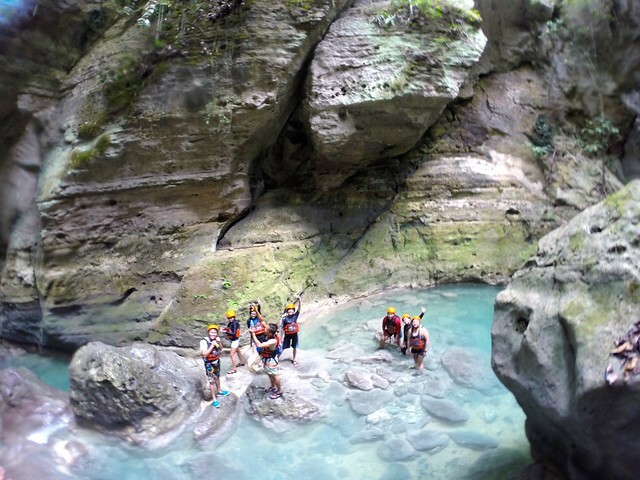 It took us four hours to finish the canyoneering. It could take shorter or longer depending on the pace of the group. We passed by the Kawasan Falls. The popular tourist spot, as expected, was crowded that time. To get back to Matutinanao Beach Resort, one can ride a motorbike for a fee or walk for about 15 minutes. We did the latter. A sumptuous and delicious lunch was served to our group when we arrived back to the resort. It was the most satisfying reward I believe our group would want to after the four-hour water adventure at Kanlaob River. 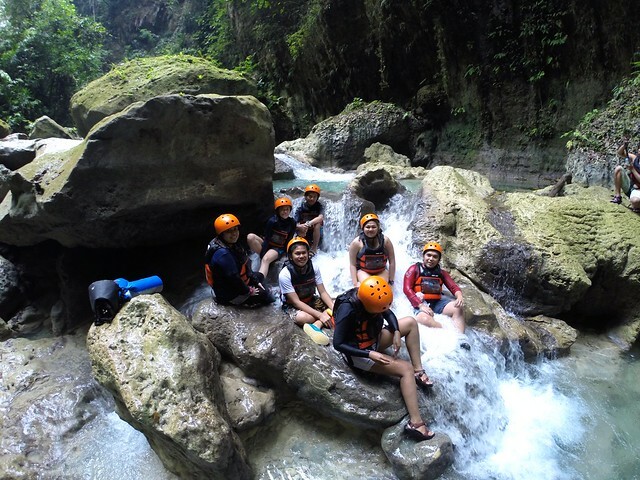 Disclosure: Kawasan Canyoneering hosted our group with our canyoneering adventure. All notes and opinions are my own. 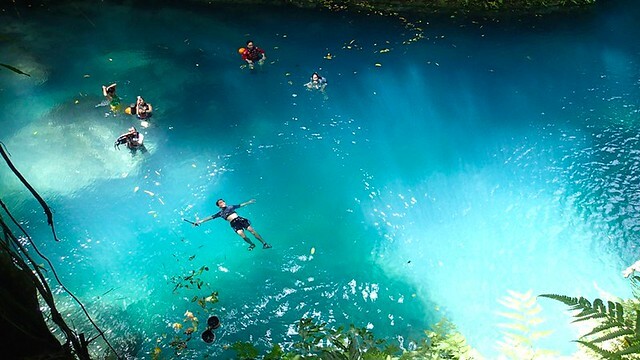 I love the Kawasan Falls, which is always in my bucket list. I will certainly do the cayoneering here. Thanks for the great post! Great post very interesting to read. 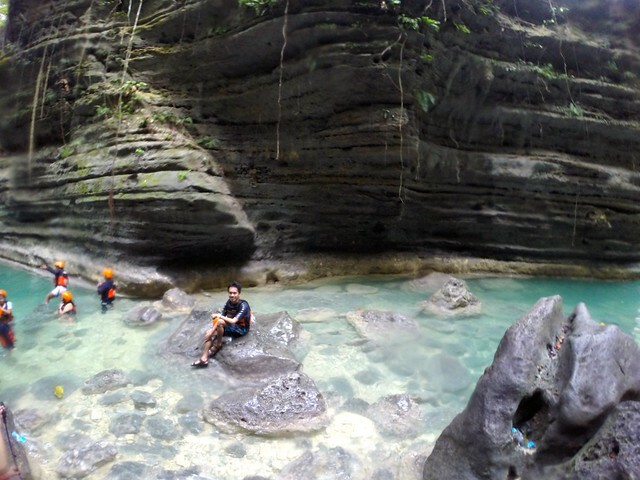 I love canyoneering and swimming at kawasan falls, been there a lot with my family and every time we go there, we enjoyed each time we go there. Wanting to go back someday! Wow! The water is just so blue and amazing. 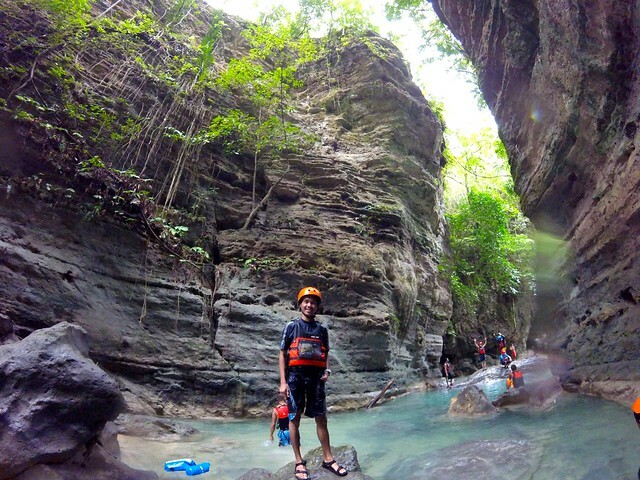 I really love to try Canyoneering. We’ve been planning to have this activity next month. Thanks for this. 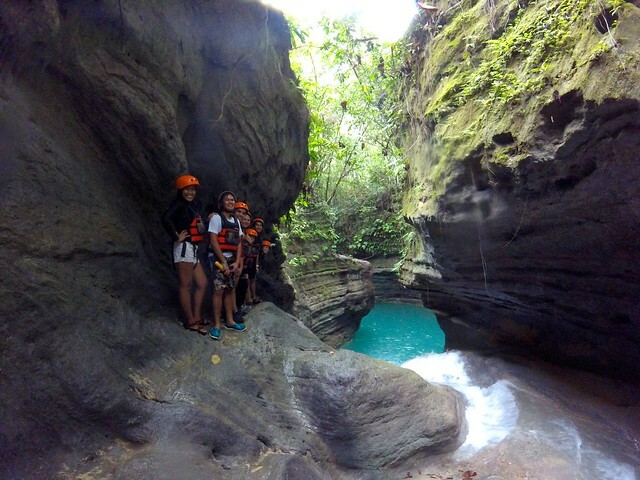 Kawasan Canyoneering is a very great adventure you will always remember for sure. Nice blog!